Simple post today. Just some more of the cheddar quilts I saw at the musuem. Above was another of my favorites! Thought I would share some pictures of the WI Musuem of Quilts and Fiber Arts with you today. The barn they restored is absolutely beautiful. Above is the outside, complete with the new addition for a shop. The shop is built around the old silo! I forgot to take a picture of it, but the outside of the old silo is a curved wall in the gift shop! The railings up to the entrance have Churn Dash settings into the wall! Here is a little mock up of the buildings on the property. And some shots of inside the musuem (the barn). I LOVE the ceiling and the ladders they have going up. And check this out! I forget all the details, but every year they have a fabric challenge. The first year (I think) they musuem was open the winner of the challenge (I think the theme was barns) made this barn! And check out what is inside of the barn! How cute is that! Tomorrow - some more pictures of the quilts! It all began innocent enough. A trip to Ye Olde Schoolhouse quilt shop. A civil war reproduction and folk art heaven. 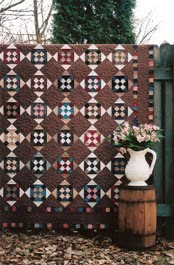 It was one of the Top 10 American Patchwork and Quilting Quilt Shops in 2010. And on the way home a stop at Patched Works. And I had just the place to have lunch in mind. Well, while finding out how to get from the lunch spot to Patched Works I noticed that we would be driving right by the Wisconsin Museum of Quilts and Fiber Arts! I knew it was in the same town as Ye Olde Schoolhouse, but since it is a ways from home I just never looked at a map to see exactly where it was. Turns out it was right on the way from the Ye Olde Schoolhouse to our lunch spot! And in checking out their web page I noticed the current exhibit that ends July 15th - "Cheddar Quilts"! 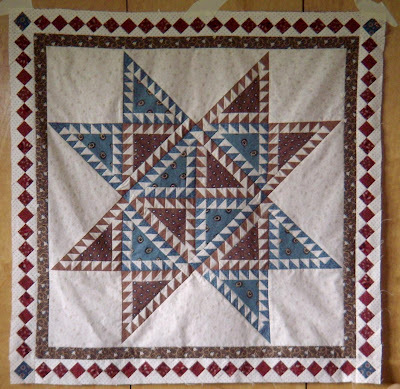 These quilts are from the collection of Carol Butzke a certified Quilt Appraiser. 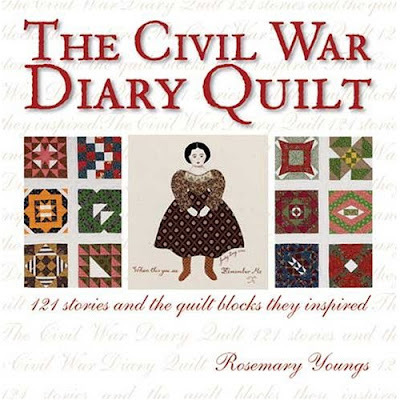 I"ve seen lectures she has given before and I knew from them that she had the most amazing antique quilts in her collection. So I HAD to see these cheddar quilts! It didn't dissapoint! I hope you enjoy just some of the quilts from the exhibit. And look at the back of these 2 quilts! Normally on old quilts you just expect to see a plain muslin fabric. Baby - these backings would be exactly what I would want on the back of one of mine! Aren't they gorgeous! Tomorrow I"ll have more pictures of the barn that houses the museum and some other lovely quilts. I got this pattern in Paducah and got my first 2 blocks done! Jan and Feb girls. The blocks finish at 4". 10 more to go! Pattern is called Little Girl by Cozy Quarters. Now that its July, I finally got my June Little Quilt done. Since I don't have July done I"ll be using June's this month!!! Its too cute not to put out anyway!